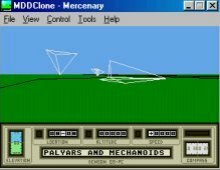 MDDClone is an amazing clone of C64/Spectrum classic Mercenary (both the original game, Escape from Targ, and The Second City mission disk) and its sequel Damocles and all mission disks for Windows. Originally designed by Paul Woakes, Mercenary is one of the best vector-based space flight/exploration games ever made. In the same vein as Elite, only not as famous, Mercenary casts you as the mercenary in the title who just crash-landed on the planet Targ. After exploring the planet for a while, you will eventually discover the main plot which offers you a lot of choices. You could work for one or both of two warring factions, the Palyars or the Mechanoids. Once you collect enough money (mostly by running errands as mercenaries typically do), you could buy a ship capable of intergalactic flight and get off the planet for good. Similar to Elite, Mercenary gives you a wonderful sense of freedom and being able to explore the self-contained world in astounding detail. You will spend most of your time exploring the planet, both above ground and below ground, in all the 3D wire-frame glory. Many locations in the city are connected by an intricate network of underground tunnels, and finding your way around these mazes takes up a good portion of the game. In addition to flying around in your ship, you can also wander around the rooms from a first-person perspective, collecting objects that may be useful (such as the keys) or useless. What makes Mercenary a wonderful game is that, like Elite, the game gives you a lot of freedom to explore. There is no time limit, and it is very hard to die. Similar to other huge, open-ended games, Mercenary has its own share of interesting secrets and even a great sense of humor. You can, for example, pick up a chunk of cheese and use it as a plane (why? Because it is a "Kraft"...) Whenever you feel like following the main plot, the in-game computer Benson is there to give you helpful hints from time to time so you won't feel too lost. With great gameplay, reasonable physics model, and a wonderful self-contained world that offers countless hours of fun discoveries, MDDClone is a faithful rendition of an 8-bit classic that was never officially released for PC. Definitely a must-play for all Elite fans, and keep checking the official site below fore news, because the author plans to include the third and final game in the trilogy called Mercenary III in the package sometime in the future ;) (and this page will be updated when that happens). The latest version even has optional corrections of bugs in the original game :) Two thumbs up, way up!